I have to make a choice between a new piano or no piano lessons. Sadly, our old piano- which has served us quite well- is now past the point of repair. Well, past the point of repair for any reasonable sum of money. We do have an electric piano which needs a new cord, but I love the sound of a real piano. The dilemmas in life! 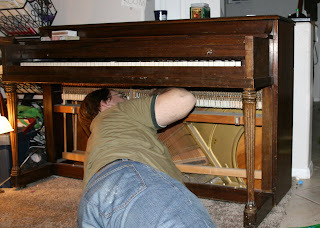 So if the piano is beyond repair, what exactly is Dave doing? I believe he is pretending that he knows anything at all about pianos and why the hammers are no longer hitting the strings. Ooh! Excellent idea! That could be some serious art work, or a gigantic Rube Goldberg machine! You should try to look in Penny Saver, or the newspaper. Sometimes you can get really great deals on used pianos. It's definitely better to keep up on the lessons than getting a new expensive one . . .
Dave looks like he knows what he is doing. Does he also tune? if so, send him over!